I’ve been on the market for a new breakfast food. Around this time I’m kind of done with oatmeal and its variants. Granola and cereal just don’t seem appealing these days. I can only eat so many eggs per week and the fun breakfast foods, i.e. pancakes, waffles and the more decadent players, are pretty much reserved for weekends. Then I thought about a breakfast muffin. I wanted something substantial, in that it was filling, nutritious, delicious and minus all the sweetness. As I was thinking about this fantasy muffin, my daughter Claire was chewing on a raw carrot, an impromptu teething ring. From there my imagination grew to include nuts and spices and oats. No, these are not seasonal flavors, but they certainly satisfied my need for another breakfast option! Let’s talk about carrots. Most of us associate this incredible vegetable with good vision. While they may be beneficial for our eyes (surprisingly not so much research has been done in this particular area), it seems carrots have much more to offer. They are super-high in Vitamin A which is good for lung health and are potent anti-carcinogens, too. All carrots, purple, red, orange, yellow, have incredible anti-oxidant properties. This is important because anti-oxidants protect our cells from oxygen-based damage, especially critical in our cardiovascular systems. That last bit is really important to keep in mind. Read it again! I couldn’t have said it better! 1. Toast the pecans in a small sauté pan over low heat until fragrant, about 5 minutes. 2. Combine dry ingredients (first 10) in a large bowl. 3. In the meantime, whisk eggs, maple syrup, olive oil, in a small bowl. Add carrots and stir well. 5. 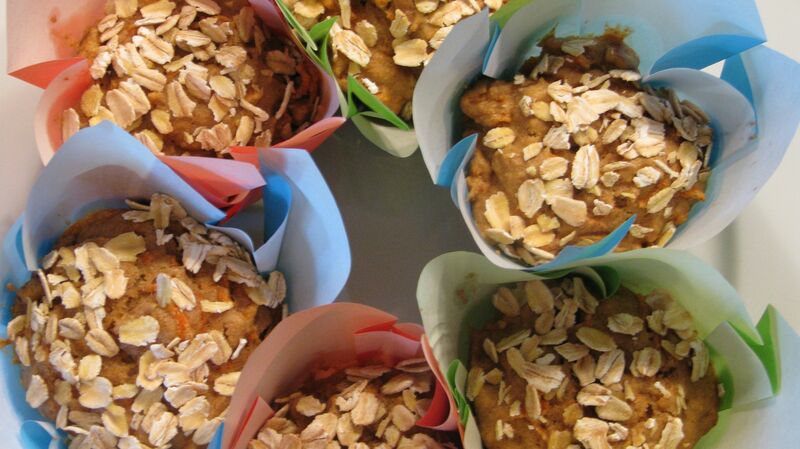 Divide the batter into 12 muffin cups and top with some oats. Bake for about 25 minutes. 1. Place squash in a food processor and process until finely chopped. Add sugar and eggs and pulse to combine. 2. In a separate bowl, add flours, baking powder, cinnamon, nutmeg and a pinch of salt. Whisk to combine well. Then add to food processor and pulse to process 5 times. Scrape down sides if necessary. 3. Add olive oil in a steady stream as food processor is mixing batter. Process just until all is evenly combined. Try not to overprocess! Just looking to combine everything together. 4. Fill paper cases in muffin tin with batter. Bake in oven at 350 degrees for 20-25 minutes. (If using mini-muffin tins it’ll be more like 15-20 minutes.) Check to see if muffins are done by piercing with a toothpick in the center of center muffin for 5 seconds. If it comes out clean, you’re in business. Remove from oven and let cool on wire rack.